To celebrate the release, I have a $20 Amazon gift card to give away. Simply enter below for your chance to win! 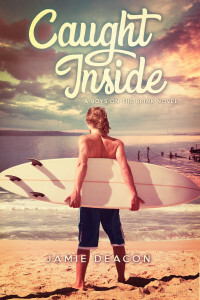 Next Post Check Out the Cover for Caught Inside and Win an Amazon Gift Card! The first time I’ve seen this available for pre-order on beaten track, I was so impressed by its blurb. I was already compelled with this story right from the very start. Actually, I downloaded the 20% sample in Smashwords just to control my craving for this book. LOL. Aww. Thanks so much, James! Congrats on the release! How exciting! Thanks a million, Christina! I’m so thrilled you enjoyed it. Congratulations, Jamie, on your brand new release! I’m looking forward to reading it! Congratulations on your new release! Sounds like an interesting read. The weather in Dallas is finally letting summers hot and humid grip on us abate. Just the perfect time to read your newest release. Congratulations!!! Thanks, Diane. Glad it’s cooling off some there!